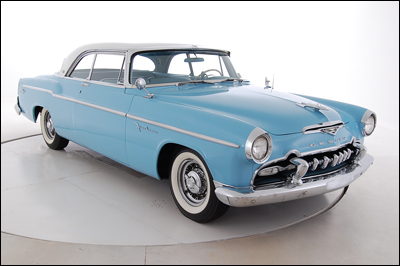 With “Forward Look” styling from the Virgil Exner design studios, and powered by the famous Chrysler Hemi V-8 engine, the 1955 Desoto was a leader in styling and performance. It was similar to the Chrysler of its day. Desoto cars were built from 1929 to 1961. The “Forward Look” was the Chrysler Corporation’s terms for styling that seemed to leap past that of its rivals. There is no doubt that the 1955 Desotos were handsome cars, not only in their day but also in ours. They still look clean and stately. It was in 1955 that Chrysler built cars began to take over design leadership, so long held by General Motors. By 1957, However GM was hastening to catch up. This 1955 Desoto Hardtop is interesting. In storage for thirty years, it is remarkable original.